Waltham Forest Arts and Literary Festival in conjunction with the Mcguffin Film Society is mounting an evening at Leytonstone Library exploring the relationship between Hitchcock and Du Maurier. 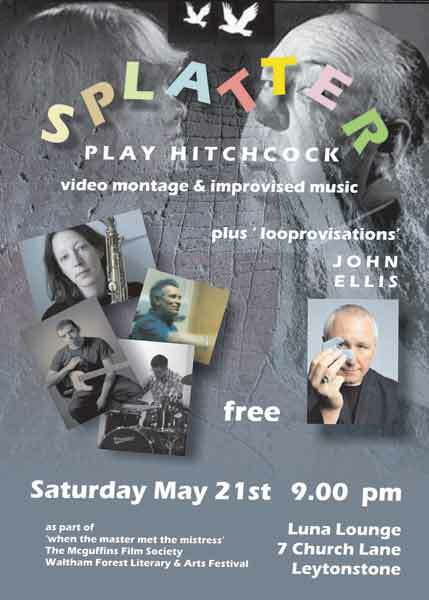 Splatter will be playing to a specially created montage of Hitchock clips, edited by Noel Taylor. This event happens later in the evening in the Luna Lounge. For those who would prefer just the music, the evening kicks off in the Luna Lounge with John Ellis, former member of The Stranglers, performing his 'looprovisations'.